The American flag has stood as a symbol of freedom and justice for over 225 years. Through wars and in times of peace, the sight of the American flag has given notice to foes and assurances to friends that democracy lives. No other symbol captures the power and glory of our nation like the American flag. It has flown as our national emblem in some form without interruption since 1777. The American flag remains a living piece of history and a source of pride and unity for all Americans. The Stars and Stripes embodies the very qualities that make our nation great: liberty, justice, freedom, love of country and national purpose. I have prepared this brochure to help you better understand the significance of the American flag and its customs for display. As always, if you have any questions or comments about this or other issues, please contact my district office at (718) 370-1384. I hope you enjoy a brief look into this symbol of American democracy. Congress establishes June 14 as Flag Day. The American flag is raised over Iwo Jima after the United States captures the island during WWII. The 50th star is added a year after Hawaii becomes the 50th state. The origins of the Stars and Stripes have become part of American folklore. It is widely believed that Betsy Ross made the first American flag. However, various towns in colonial America have claimed to be the birthplace of the Stars and Stripes. We know that on June 14, 1777, the Continental Congress adopted the Stars and Stripes as the official flag for the United States of America. The Declaration of Independence made this resolution necessary. Previously, each colony had their own flag, which they flew on colonial vessels. England considered these armed vessels pirate ships and hanged their crews when they were captured. The American flag was designed to represent the new union of the thirteen original states: it would have thirteen stripes, alternate red and white, and thirteen stars, white on a blue field. One of the first flags had the stars arranged in a circle, based on the idea that all colonies were equal. The thirteen stripes, resting side by side, represented the struggle for independence; red stood for valor, white signified purity and blue represented loyalty. In 1818, after a few design changes, the United States Congress decided to retain the flag's original thirteen stripes and add new stars to reflect each new state that entered the union. Since then, Americans have fought for and died to preserve the ideals of democracy represented by the flag. Display the flag from sunrise to sunset on buildings or flagstaffs and at night, only if properly lighted. The flag should be raised and lowered by hand and never raised furled. Always hoist the flag briskly and lower it ceremoniously. The flag may be displayed on any day, but especially on national holidays. On Memorial Day, display the flag at half-mast until noon only; then hoist it to the top of the staff. When carried, the flag should be held aloft, never flat or horizontal. 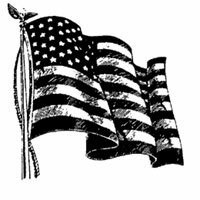 Salute a flag when it passes by in a parade, during the Pledge of Allegiance or National Anthem and in a ceremony raising or lowering it. The flag should never be allowed to touch the ground or floor, nor brush against any objects, nor be used as drapery of any sort. The flag should never be displayed with the union down except as a signal of distress in instances of extreme danger. When a flag is no longer in a condition to be displayed, it should be destroyed in a dignified way, preferably by burning.